Farewell España should be seen as the first in a number of books describing the history of one of Europe's persecuted minorities. Howard M Sachar has written a shelf full of books on aspects of Jewish history, as well as being editor of the 39 volume The Rise of Israel. I found both Farewell España (early modern history) and A History of Jews in the Modern World (which develops and carries the story forward to modern times) to be works of scholarship and readable too. In combining the two attributes, Prof Sachar has shown himself a literary craftsman. 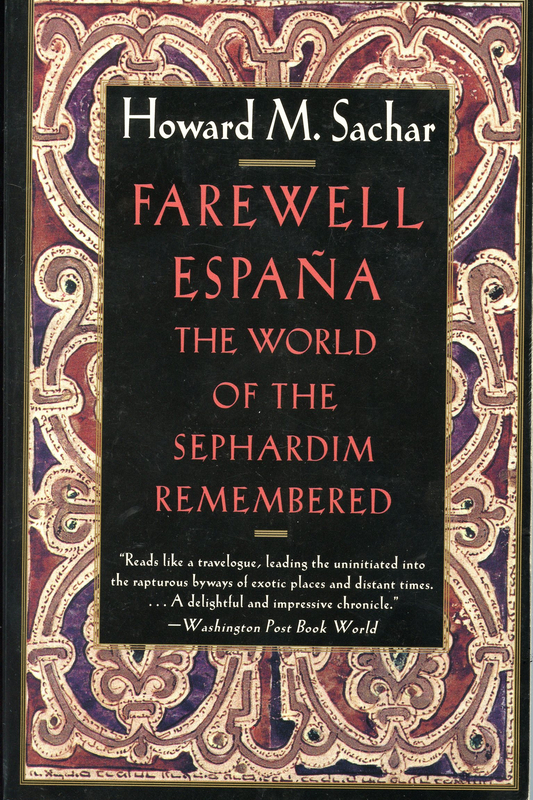 Farewell España takes us to North Africa, Italy, the Ottoman Empire, France, the Netherlands and Germany. We even visit England, Brazil and other territories in the inchoate European Empires of the Americas. The sheer breadth of the book is wonderful, and clearly the outcome of a lifetime's study. Sachar writes dispassionately about the suffering of his ancestors - and ours too; I take the view of the Marquês de Pombal in 1770s Portugal, that each and every European has some Jewish blood in his veins. After so long and so close contact, it is impossible that it should be otherwise. The obverse to the persecuted minority is of course the persecuting majority, and Sachar is again dispassionate in his relation of the horrors visited by Christian (and Moslem) states on their Jewish subjects. Few European countries have a record to be proud of in this respect. Surprisingly, the Italian people did more to protect Sephardic Jews during the Fascist persecutions than people of other nations; the Danes also shielded most Danish Jews from Nazi persecution, and I suspect that Danish Jews were not Sephardim but Ashkenazim. The Sephardim are different from the Ashkenazim who are different from the Mizrahim. The Sephardim regard themselves as the aristocrats of the Diaspora, and after reading this book, I can see why they should think so. Since so many of the Jews expelled from Spain in 1492 found a temporary haven in Portugal it is difficult to separate the Spanish from the Portuguese and many Jews in the sixteenth and seventeenth centuries referred to themselves as "Portugals" to hide their origins and their religion. In seventeenth century England, António Robles was accused as a member of the Portuguese nation and saved his business from confiscation by admitting to the Council of State that he was a Portuguese of the Hebrew nation. For a single volume history of the Sephardic Jews, this book would be hard to beat. Because this Jewish community was so close to its Christian persecutor for so long, their story must be a part of mainstream European history. Professor Sachar has done a very good job in weaving together the disparate geographical strands to write an excellent and readable history. Thoroughly recommended.